When I mark new strings for localization, they show up in the tool, it writes the proper code in View (most of the time), but the Resources class doesn't get the new property I found out I can manually add the property to the Resources class (but it's a lot of manual work that I kind of expected the tool to do for me). Thanks for taking your time to read this. Let me know if you need more info. This should fix the problem with inverted commas in HTML text. I could not reproduce the problem generating resources. Can you try the command "Store resources for Web projects" in the Runtime-Support-Menu (3rd button on the toolbar). This version also contains some initial support for IStringLocalizer. At present, it is only in code files (.cs) and not in views (.cshtml) and it is restricted to Controller classes. 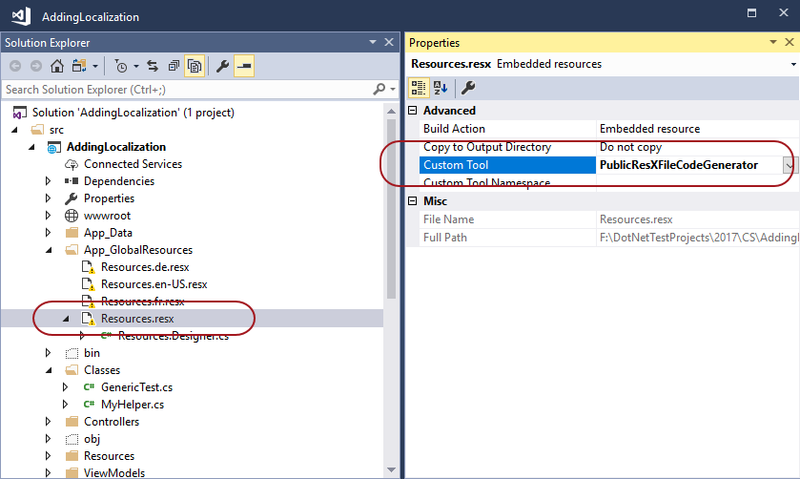 You can select the option in the project properties dialog or in the "wizard" dialog when you add support to a new project. I will write a more detailed description later, when I have added support for views. Sorry about that. I think that your project contains a generic class, which caused the error. I tried to "Store resources for Web projects", but it didn't fix the problem. I think below is the log file related to this action (new string is called "I'm lovin it"). If the problem is that the .resx file (Resources.resx) is generated, but the code file (Resources.Designer.cs) then it is a problem with the "CustomTool" property. Can you select the resource file in the solution explorer, go to the properties window and check the Custom Tool property. If it is empty, then set it to PublicResXFileCodeGenerator. 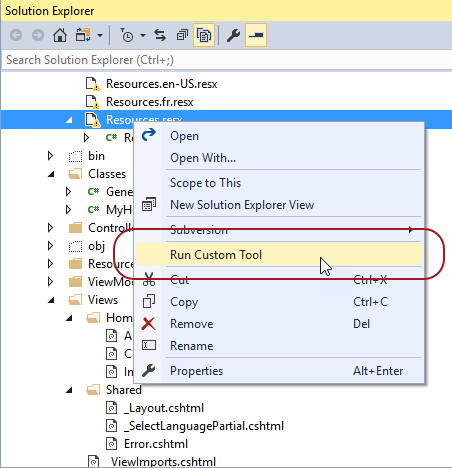 It will probably generate the code file immediately, but if not, there is a command in the context menu in the solution explorer "Run Custom Tool"
Multi-Language can and should set this property automatically. It does set it for some project types when it creates the file, but not for Web Projects. In fact, there is a comment in the code that it should not be done for web-site projects, but I am sure that this refers to a very old version of ASP.NET. I will check which project types require it and which do not, and update the code. I have found another issue, which applies to Web Site projects but not to Web Application projects. If the project is a Web Site, then my previous reply is nonsense, because you cannot define a custom tool for the resource file. In some way which I don't really understand, ASP generates an equivalent class on the fly. However, the code generated by Multi-Language in a code file is incorrect. 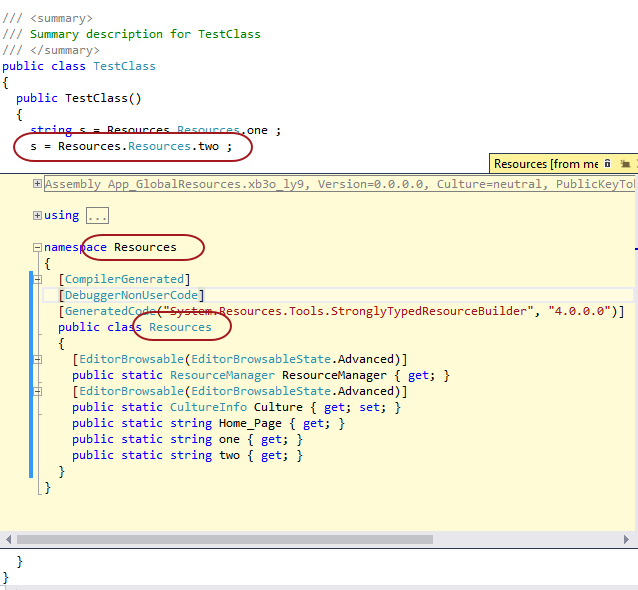 The resource name has to be prefixed with Resources.Resources., where both the Namespace and Class are named resources. This is shown in the following screen shot, with a 'peek' at the generated code. It does work to specify "using Resources;" at the top of the file, and to use only Resources. as the prefix. Strangely, the same does not apply in .cshtml files. In that case it is possible to write @using Resources; at the top of the file, and to use the simpler prefix Resources. This change actually affects both .cs and .cshtml files, but I will try to return to the shorter version in .cshtml files in the next update. I have changed my mind on that, because it is more difficult than I expected. I would rather push on with IStringLocalizer support . I will try to come back to it later. I tried to set "Custom Tool" to "PublicResXFileCodeGenerator" (right clicking resx file, selecting properties, going to "Embedded Resource" configuration and manually pasting before mentioned string since I was unable to select anything from a drop down like on your screenshot). One or more values are invalid. An internal error occurred. Please contact Microsoft Product Support Services.